Junior and Sports Editor Sean Billings has had the opportunity to experience both classes with Mr. Oliver and Mrs. Guthrie. One of the most memorable aspects Billings recalls in Mr. Oliver’s class was the importance of accuracy which stemmed from Oliver’s mission statement to change the way people thought of journalists. Billings believes that he is more independent in this year’s journalism class as opposed to last year’s class with Mr. Oliver. “This year’s class definitely involves more communication and interacting,” says Billings. Billings describes the atmosphere of Mrs. Guthrie’s class as more lenient and feels as if he can work more independently. Although there have been some changes to the function and dynamic of the journalism class, Billings believes both share a common goal which is to improve the writing of the staff members and hopefully set career paths. Last year’s journalism teacher, Bobby Oliver earned a degree in journalism and taught the class for six years. After a stressful period in his life, Oliver made the difficult decision to move on from teaching journalism. Oliver does not regret his decision and believes it would be impossible to work around that schedule now with his growing paternal responsibilities. He’s recently taken up teaching the Advancement Via Individual Determination (AVID). Oliver’s goal for his class was to turn around the corrupt journalistic image by encouraging diligence and committing to the idea of a serious journalistic institution. “I feel like there’s this kind of culture now where everyone’s kind of waiting for a journalist to mess up which is different than how it used to be, it used to be you would take a journalists at their word and now there’s this culture that journalists are not trustworthy,” says Oliver. Oliver believes that he and Mrs. Guthrie are more similar than unalike in the way they run their class. “I think we’re more comfortable in that coaching role,” says Oliver. Oliver’s favorite aspect about teaching journalism was how good the feeling he got was when one of students wanted to pursue a career in journalism. “To see my students participate in that was so powerful for me,” says Oliver. Oliver states that the thing he will miss most is the meaningful connections and relationships he has built with his students over the years but finds that fulfillment now in his AVID class. Oliver advises future journalism staff members to take their audience into consideration when writing an article. The current journalism teacher Guthrie states that her goal for her class is to create a collaborative environment where students can develop stories for the school. Guthrie encourages this by offering the newspaper staff members lots of choice which includes where, when and how they work. Guthrie ensures productivity by setting a parallel track for her students and clear deadlines. 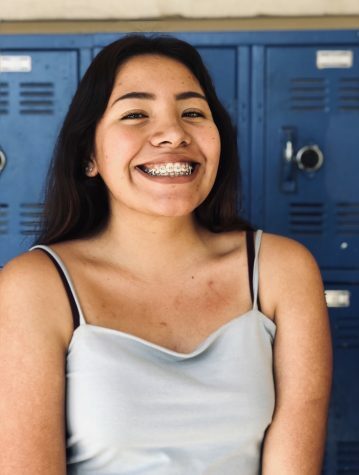 Her goal is to run a student led newspaper in which students are responsible for overseeing all content development writing and publishing for the student newspaper. One of the ways she accomplishes this is by allowing the students to control the class. This year Aysha Brown and Hunter Barry carry that responsibility and supervise staff members to ensure they are providing the school with accurate information about the world around them. Guthrie believes that the world we live in today consumes their news and content through technology which is why it is essential to practice these techniques. “Today’s world is a very connected world and it is very important that our students are practicing skills that they will use in the future,” says Guthrie. Guthrie favors the opportunity to observe students taking charge on writing articles that they are passionate about and getting creative with their viewpoints on stories.